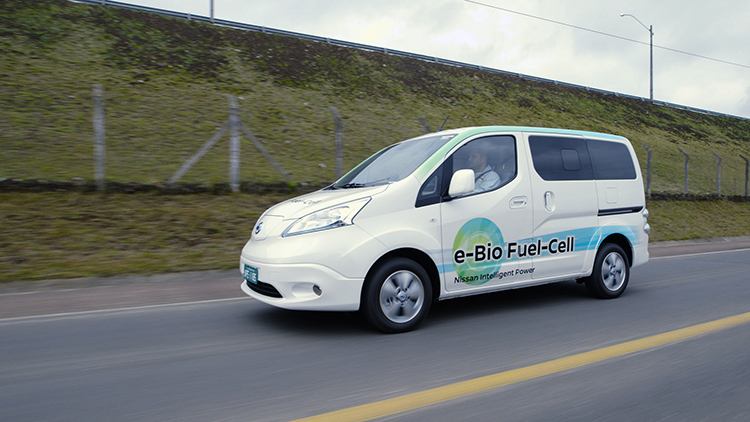 In Brazil, Nissan Motor revealed the world’s first Solid Oxide Fuel-Cell (SOFC)-powered prototype vehicle that runs on bio-ethanol electric power. The fuel cell prototype forms part of Nissan’s ongoing commitment to the development of zero-emission vehicles. Nissan already sells the world’s highest-volume zero-emission car, the LEAF, and is pioneering Intelligent Mobility systems that will be deployed in a range of vehicles over coming years. In this latest zero-emission development, the e-Bio Fuel-Cell prototype vehicle runs on 100-percent ethanol to charge a 24kWh battery that enables a cruising range of more than 600km. Nissan will conduct further field tests on public roads in Brazil using the prototype.